I'm not sure when it was that I first saw a picture of one of the window displays at Yotam Ottolenghi and Sami Tamimi's Restaurant "Ottolenghi" in London, but suffice it to say that I loved everything about what I saw: the abundance... the beautiful vegetables... the variety of grains... and most of all the fantastical display of miniature desserts (cakes, tarts, meringues, cookies...). I was...and still am...completely enamored. Regular readers will know that I cook and bake under the influence of these two talented chefs all the time. 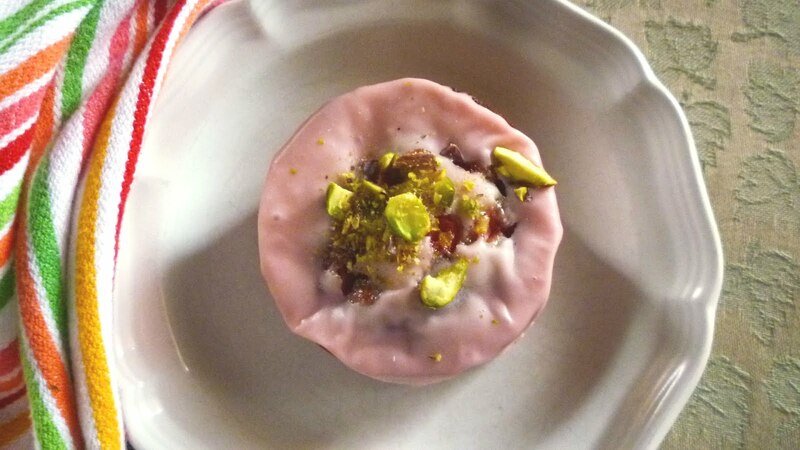 The little cakes I am posting today make frequent appearances in their displays, so I think it is safe to say that I first became aware of them because of my admiration for the Ottolenghi chefs. This particular recipe is in fact adapted from one of theirs. If you have never heard of a friand (pronounced fryʹ uhnd), let me introduce you. Friands are little muffin-sized cakes that are popular in Australia and New Zealand. The word Friand is actually French (pronounced freeʹ ahn) and means "tasty morsel". 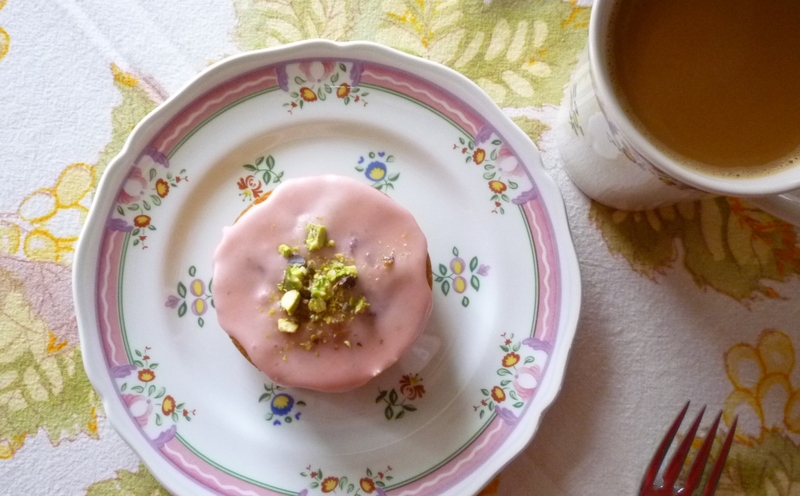 The cakes themselves are almost identical to a French petit four called a financier. Both cakes are made of roughly equal quantities of egg whites, melted butter, sugar and a blend of all purpose (plain) and nut flours. As far as I am able to tell, the most significant difference between them is twofold: When making financiers, the melted butter is always browned first. 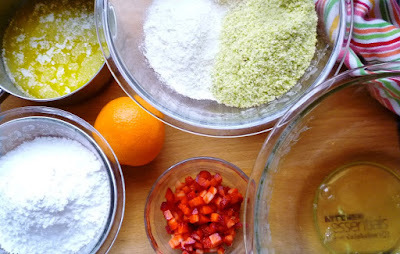 When making friands, it appears that the sugar used is always powdered (icing) sugar. I would also add that in my experience, friands tend to have a higher percentage of sugar. They are quite sweet. 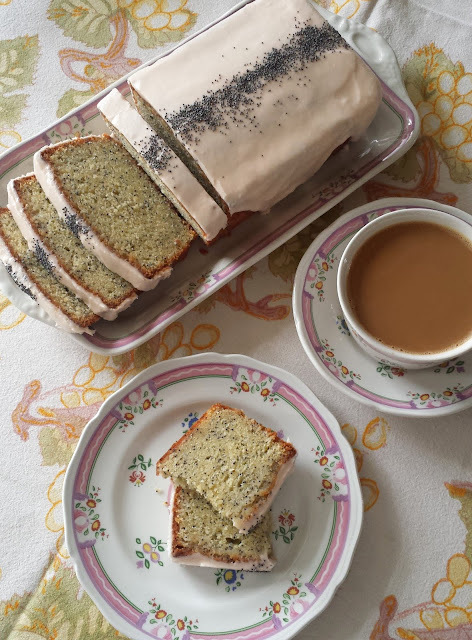 I like to eat cake for breakfast, but I would probably not choose a friand for breakfast...they are definitely a tea time/dessert treat. Some will tell you that another difference is that friands usually have added fruit...sometimes bits of chocolate. But since more and more you will see financiers made with added fruit, I'm not sure this distinction is particularly valid. To be honest, I think the best definition is that the friand is the Down Under version of a financier. A financier is, after all, a tasty morsel. 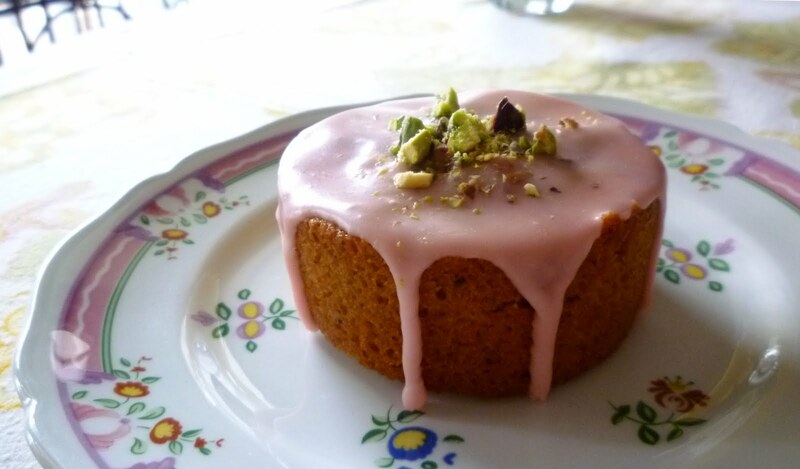 Both financiers and friands are usually made with almond meal/flour. But you can of course make them with all kinds of nut flours. Almond flour is widely available these days...other nut flours, not so much. Occasionally I will see hazelnut flour. But I have never seen pistachio flour. (Of course, that doesn't mean it isn't out there). I use a drum-style rotary grater, fitted with the finest drum, to grind small quantities of nuts into nut flours. You can attempt to grind nuts to a flour in your food processor, but even if you are able to do so without creating nut butter, you will find that instead of a fluffy, flour-like texture, you will have produced something that is rather oily and has the heavy texture of sand. It might make an acceptable cake...but the texture would not be as light. If you like to bake with nut flours, it is definitely worth seeking out a special nut grinder/grater of some kind. The texture of a friand is probably not what you might expect. They are often compared to muffins, but their texture is not muffin-like at all. They are tender and moist (like a good muffin)...but whereas a muffin is supposed to be light and airy, a friand is rich and dense (in fact, rather pound cake-like). One of the particular qualities that I love in both financiers and friands is the browned, tender-chewy exterior crust. If you were to try to dig in with your fork, you might decide you had encountered a tough or a hard cake. But if you pick it up and eat it with your fingers, you will discover that it isn't in the slightest bit tough or hard. Rather, it has a definite and pleasant chew before dissolving into sweet, nutty and buttery deliciousness in your mouth. The particular texture of the crust as I have described it is most pronounced on the day the friands are made. After that, the exterior softens a bit. It is still very good...just not the same. Some might in fact prefer the texture on the second or third day. Since the cakes can be iced with a powdered sugar glaze that tends to dissolve when it comes in contact with moisture—like the moisture in the fruit scattered over the top of the cake—it is best to ice the cakes on the day they will be served. It is not the end of the world if the icing dissolves a bit, it's just not as pretty (they still taste great). You can also forgo the icing altogether and serve the cakes with nothing more than a dusting of powdered sugar. Finally, for those of you who have been following my blog for a long time now, you might realize that the presence of a pistachio cake can only mean one thing. That's right...an anniversary. I began keeping For Love of the Table seven years ago today. 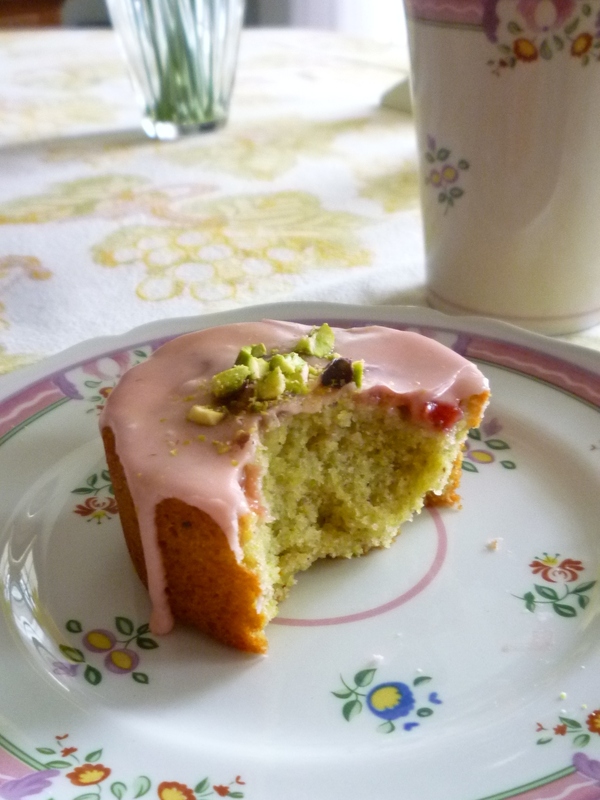 Ever since the first anniversary I have always posted something pistachio on the day (most often a cake). It's difficult to believe it has been so long. I will have to sit down to a bite of cake to mark the occasion. I hope you will vicariously join me. And, I hope you will continue to visit For Love of the Table...where, for the foreseeable future, I will continue to share all kinds of delicious things to cook and bake...so that you will be able to share them with the people you love...at your table. Use a tablespoon (15g) of the melted butter to generously brush the bottoms and sides of the pan(s) (see note). This buttery coating helps create the crisp edges that are one of the special characteristics of a friand. Chill the pan(s) to firm up the butter. Place all of the dry ingredients in a medium bowl and whisk to combine. Set aside. Place the egg whites in a medium bowl and using a clean whisk, whip the whites until very frothy/foamy. It isn't necessary to whip them to soft peaks—you just want to loosen them up a bit. Spread the dry ingredients over the top of the egg whites. Add the zest to the cooled butter and pour this mixture over the dry ingredients. Fold all the ingredients into the egg whites, mixing just until the batter is smooth and uniform. You may use the batter immediately or cover and chill for a day or two. Place the pan(s) on a baking sheet and place in the middle of the preheated oven (if your baking sheet is very thick or heavy, place it in the oven while the oven is preheating and then just place the cake pans directly on the preheated sheet). Bake for 20 to 35 minutes (depending on the size and depth of your pan) until the friands have risen, are golden around the edges and springy to the touch. A skewer inserted into the center of one should come out clean. Take the friands out of the oven and leave them to cool in the pans for 3 to 5 minutes. Don't allow them to stay too long in the molds or they will stick. Turn the cakes out (running a sharp knife around the edges first if they seem to want to stick). Transfer the cakes to a wire rack to cool. To finish: Dredge the cooled cakes with powdered sugar or ice them with the strawberry glaze. 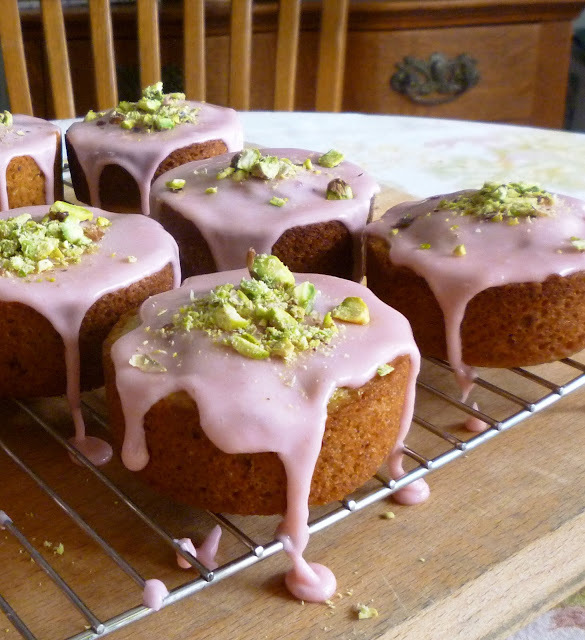 To glaze the cakes, place them on a wire rack set over a baking sheet. 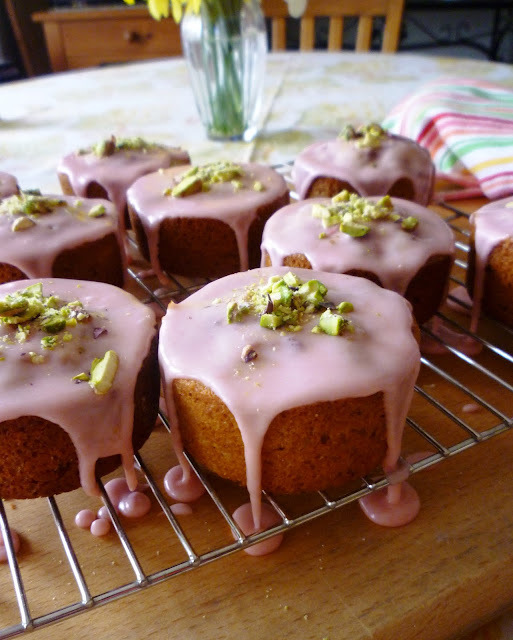 Drop a blob of glaze on the top of each cake and spread out to the edges, allowing it to slowly drip down the sides. Before the glaze is set, sprinkle the top of each cake with a few chopped pistachios. Un-iced, the friands will keep—in an airtight container—for several days. Glazing/icing should be done on the day they will be served. Note on pans: You may use any shape of small, muffin-sized cake tin that you like as long as you butter it well and don't fill it any more than 2/3 to 3/4 full. You can use a muffin pan...or small loaf pans. I use a couple of individual cheesecake pans. These are similar to 6 cup muffin tins, but have straight sides and removable bottoms. The holes in my pans are two inches deep and 2 3/4 inches in diameter. I only fill them about half full (75g batter each) because I don't want the cakes to be too large. The recipe makes 10 cakes of this size. You could probably use individual porcelain/china/stoneware ramekins too. Place the berries in a small bows and smash with a fork. Pass through a fine sieve, pressing the pulp against the sides. Measure out 25 grams of strained strawberry purée. Place the powdered sugar in a small bowl and add the measured berry purée, the milk and the lemon juice. Stir with a rubber spatula to make a thick, smooth glaze. It should be just thick enough so that it will slowly drip down the sides of the cakes when spread on the top. Adjust the consistency with milk, strawberry purée or powdered sugar. Cover with plastic wrap until ready to use. Thanks Kristina! You'll have to let me know how they turn out for you if you make them.